By William J. Neal, Dept. of Geology, Grand Valley State University, Allendale, MI, and Joseph T. Kelley, School of Earth and Climate Sciences, University of Maine, Orono, ME. 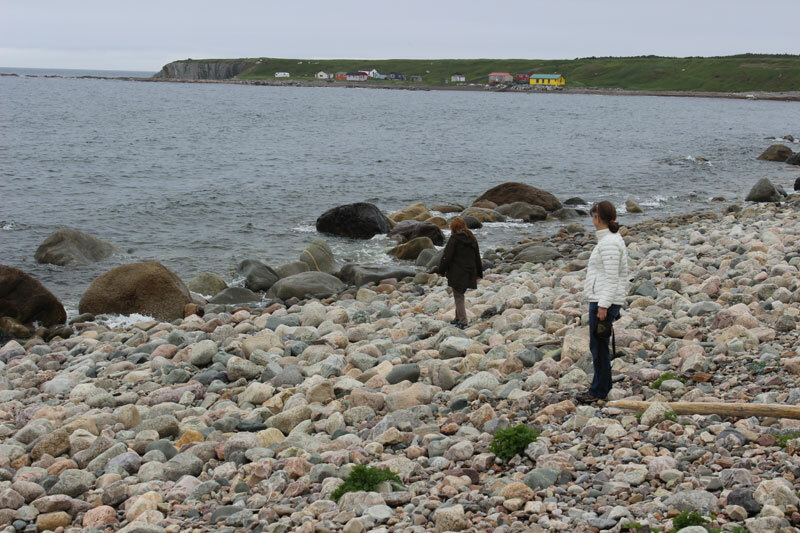 “Newfoundland” as a coastal place does not conjure up images of sandy beaches, but rather scenes of wave-cut rocky cliffs, bird rookeries on small rock islands, sea stacks, and boulder and cobble beaches if wave deposits are present. But scattered among the latter are genuine sand beaches – sometimes in association with gravel deposits, but where sizes are distinctly sorted by variable wave energies from strong storms to the quieter times of gentle waves. Beach types range from a few long reaches and shorter arcuate strands where greater sand supplies are available, to pocket beaches in protected coves of lower wave energy. Although not all inclusive, Figure 1 shows the distribution of the beaches mentioned here. Geologically, Newfoundland is an extension of the Appalachian Mountains with a geologic history that produced a wide range of igneous, metamorphic, and sedimentary rocks, ranging in age from Precambrian through Paleozoic, in three distinct structural zones. These three SW-NE trending zones are reflected in the island’s geography, and controlled the land’s response to the much more recent glacial erosion during the Pleistocene. The direction of ice movement either paralleled the structural trends, or flowed off of the highlands, and had much to do with the great irregularity of Newfoundland’s coast – over 17,500 km in length. The glaciers originally produced most of the sediment found on today’s beaches – from sand to cobbles- by grinding up rocks they passed across. 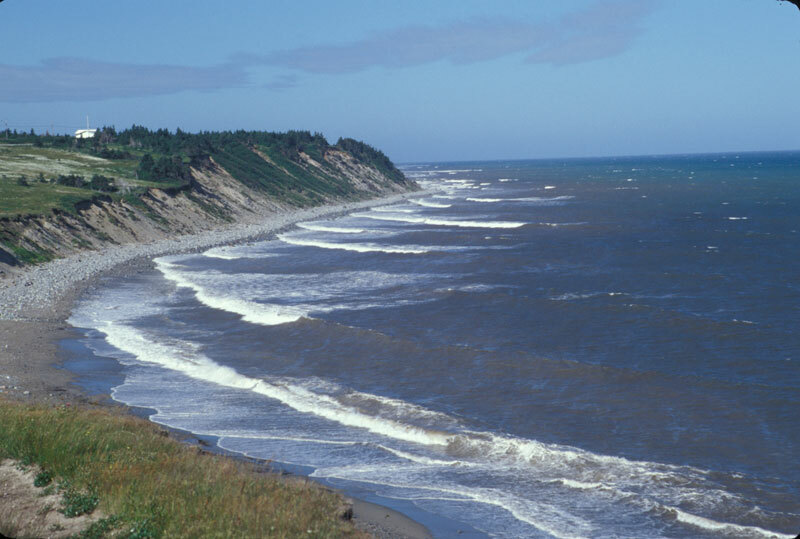 Old glacial outwash deposits such as deltas, the coarser fractions of tills, and raised beach ridges are often the immediate sediment sources for the modern beaches, brought to the shore by rivers, or directly eroded by waves. The Western Zone includes the great north-trending arm of the Long Range Mountains, where glaciers during many glaciations stretching back more than a million years carved deep fjords from E to W into the sea. 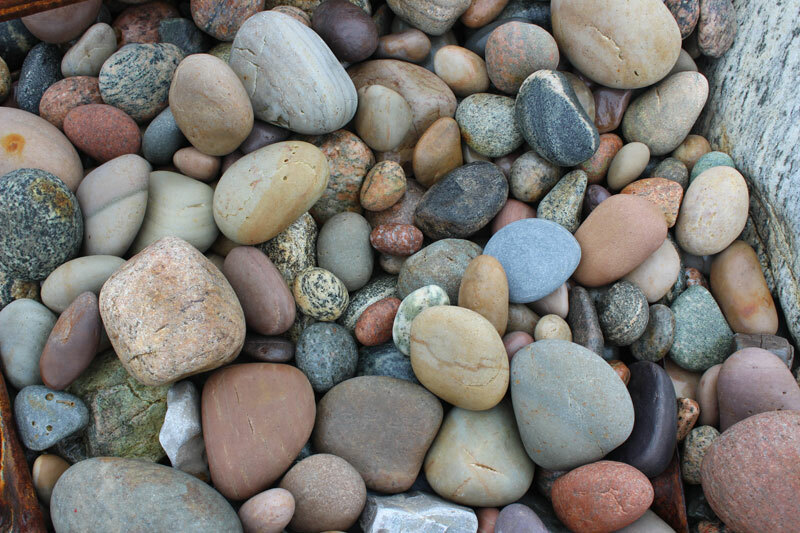 The variety of rock types seen in the cobble and gravel beaches, as at Green Point and Martin’s Point, is a reflection of varied geology back in the source area (Figures 2 and 3). 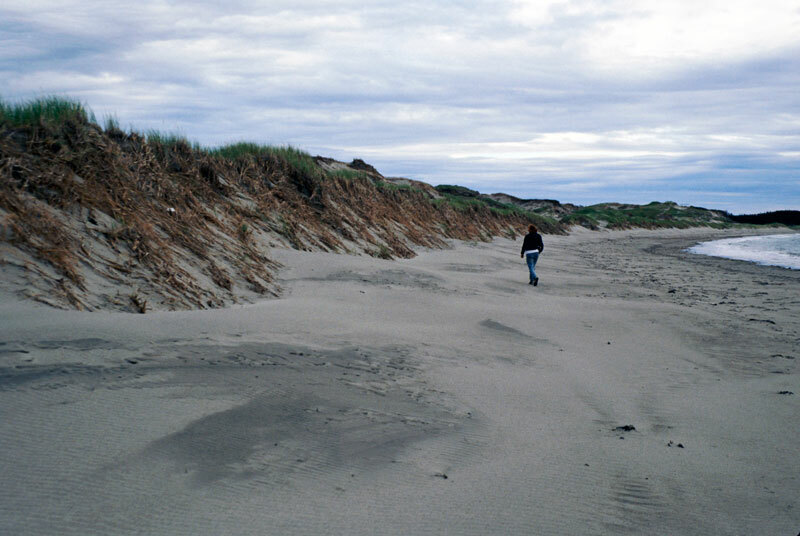 The composition of sandy beaches and dunes vary similarly. 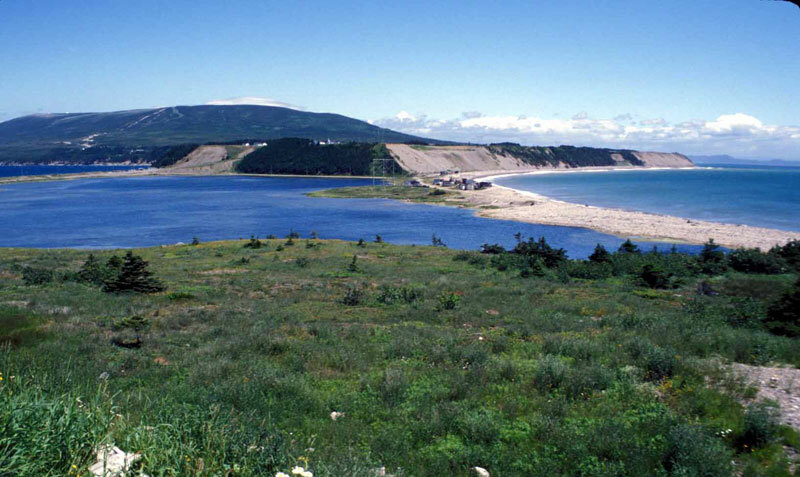 Port au Port, at the south end of the western arm, is a huge double tombolo (two sand beach bars that connected the mainland to what was once an island, forming the Port au Port Peninsula). 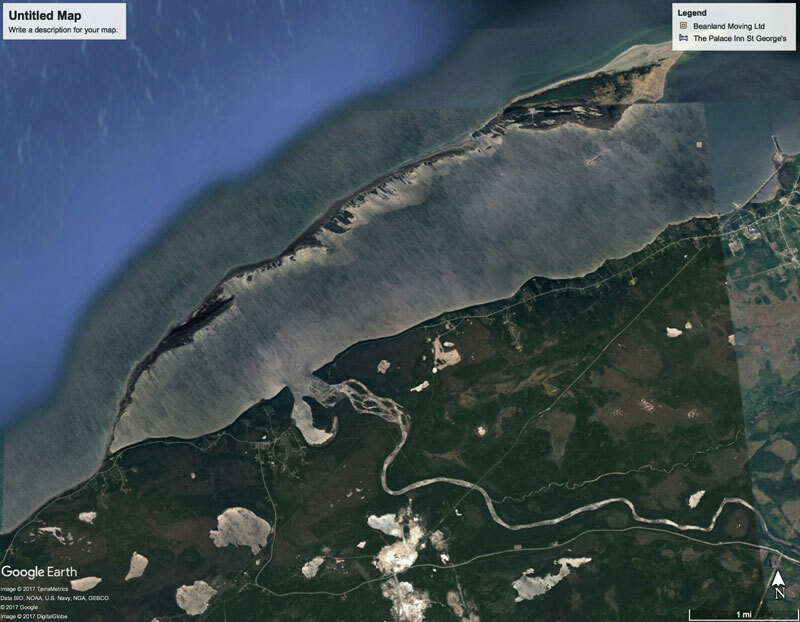 The light-colored beach sand is derived from an eroding high-stand delta (with an endangered cemetery on top) (Figure 4A). 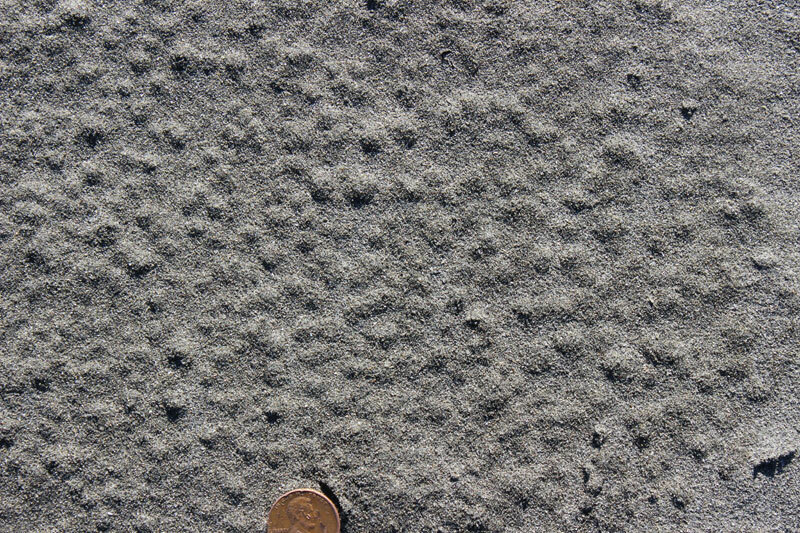 Similar sand-rich deposits in the area were the sediment sources for Flat Island, a classic spit on the SW coast (Figures 4B&C). 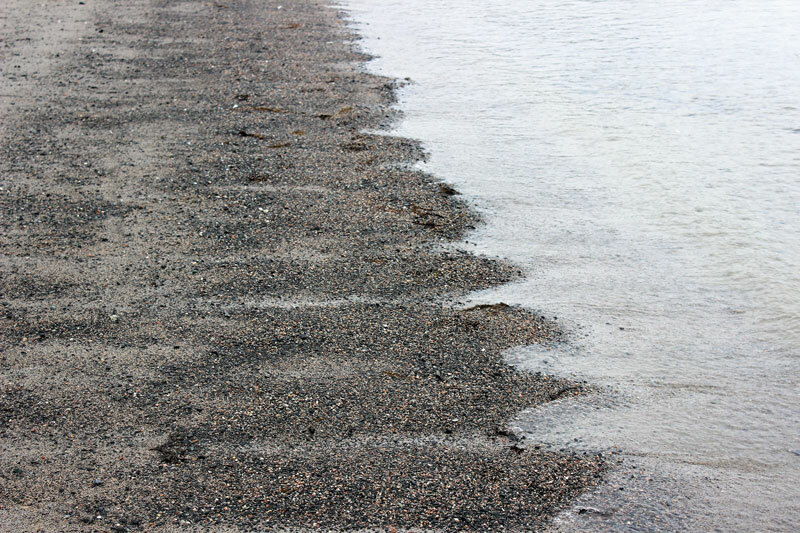 In contrast the poorly-sorted beach sand at Trout River on the south edge of Gros Morne National Park is dark in color because of an abundance of sand and granule-sized rock fragments (Figure 5). 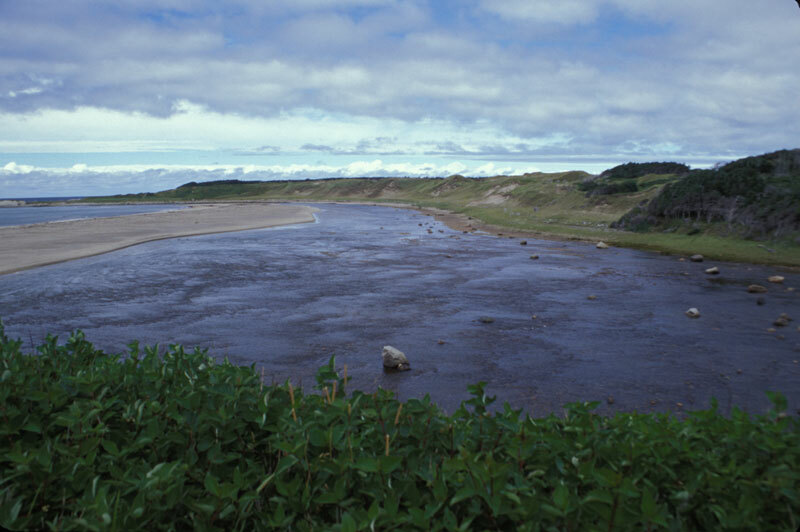 The main road north (highway 430) along the western arm provides access to various interesting sites – a few small beaches, often near stream mouths (Figure 6A) and with associated dune fields, such as Shallow Bay beach (Figure 6B) near Daniel’s Harbor, and the Three Arches (Figure 7), a popular spot for viewing erosional features. 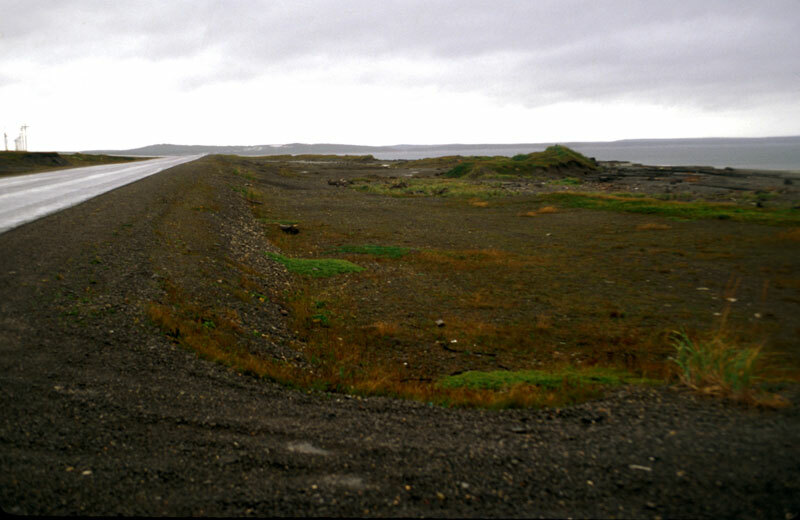 These arches and elevated beaches at localities such as Port au Choix are evidence of glacial rebound, the post-glacial uplift after the mass of the glacier was removed. 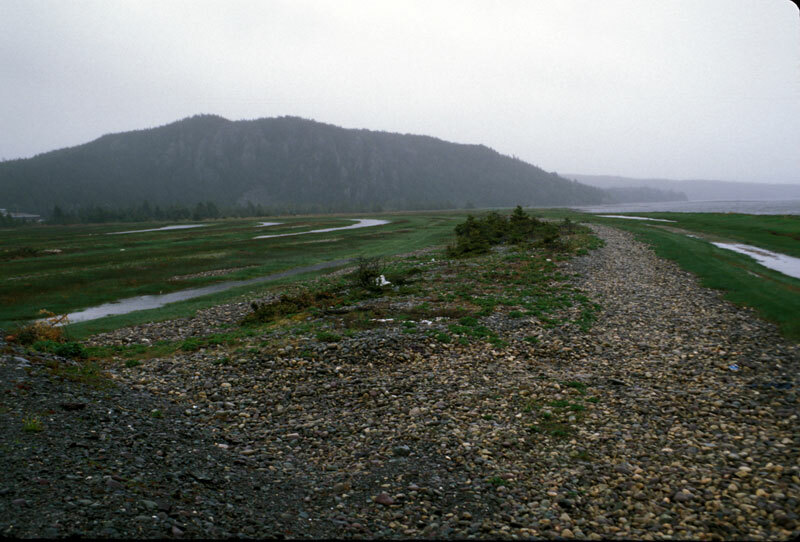 This western highway (430) is the access route to Port au Choix and L’Anse au Meadows (Viking settlement), and there is still evidence of where beaches and dunes were mined away, probably in the late 1950s and early 1960s to build the road, completed in 1962 (Figure 8). The island’s Central Zone has a highly crenulated northern coast, while its southern coast line is cut by numerous narrow fjord-like embayments. We visited no beach locales in this section because there is no road along the southern coast, and the highway is distant from the northern coast, but some of the coves are home to small pocket beaches. The Eastern Zone also has good examples of such pocket beaches in coves. 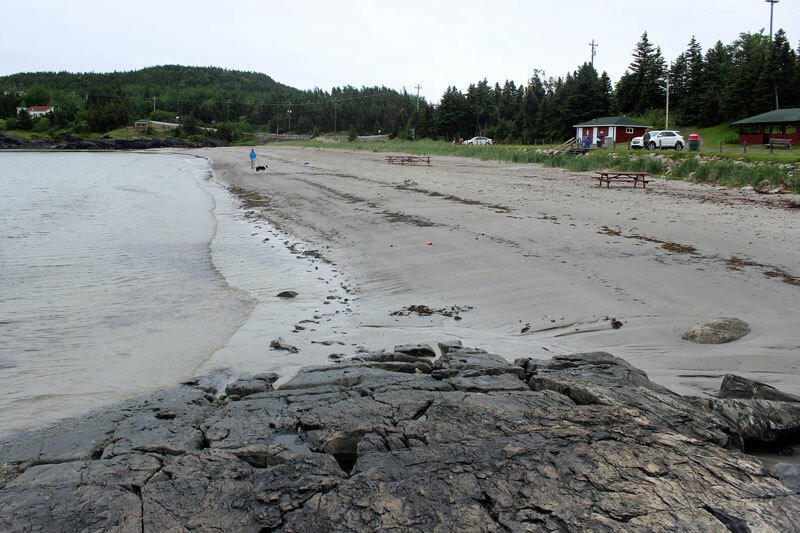 The Eastport Peninsula touts three beaches as tourist attractions. 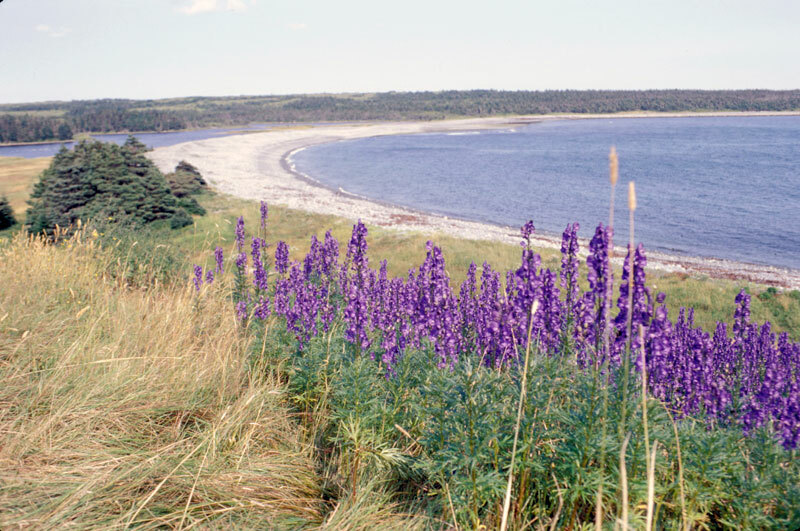 Sandy Cove, the most scenic, is a light-colored beach of sand derived from the erosion of a Pleistocene delta that forms the upland behind the beach. The bare-bluff face rises 75 feet above sea level. 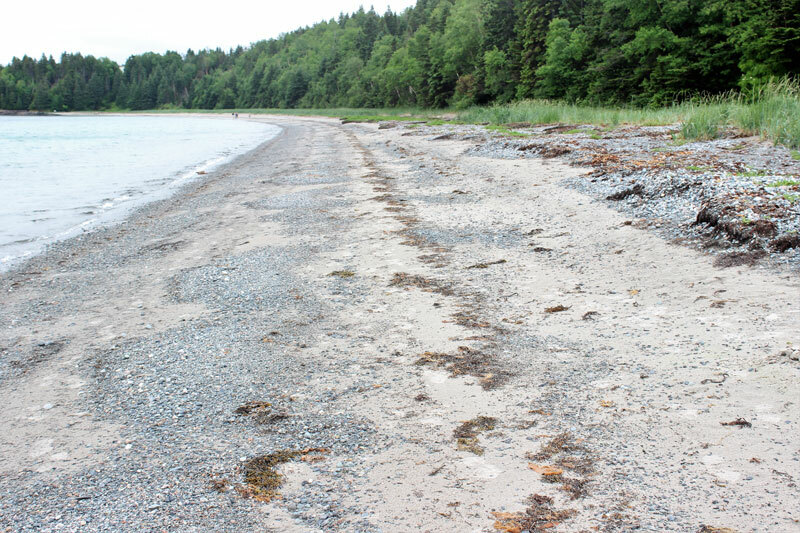 In nearby Eastport, the smaller public beach has convenient access and public facilities (Figure 9) with some interesting beach features including multiple wrack lines, cusps (Figure 10), and erosional features associated with a creek mouth (Figure 11). Nearby is Northside Beach, a longer reach with a higher gravel component, and evidence of multiple higher stands of water level (Figure 12). 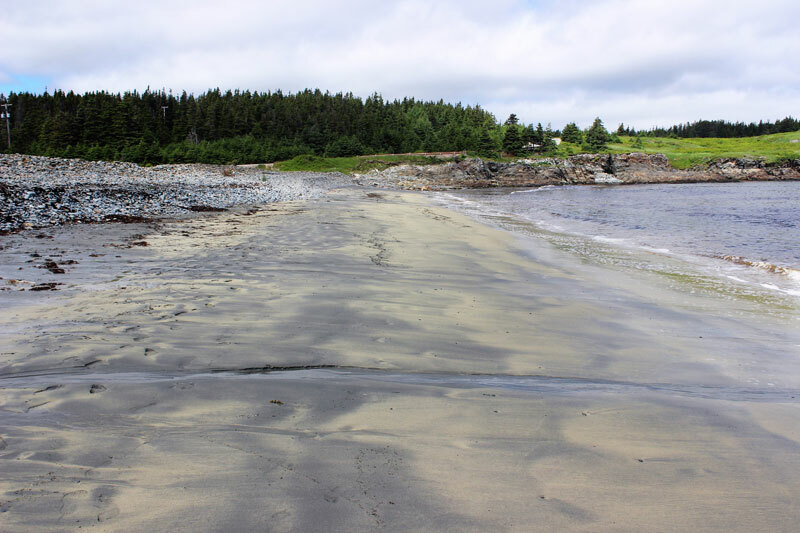 One of the most interesting Eastern Zone beaches is at Elliston on the Bonavista Peninsula. 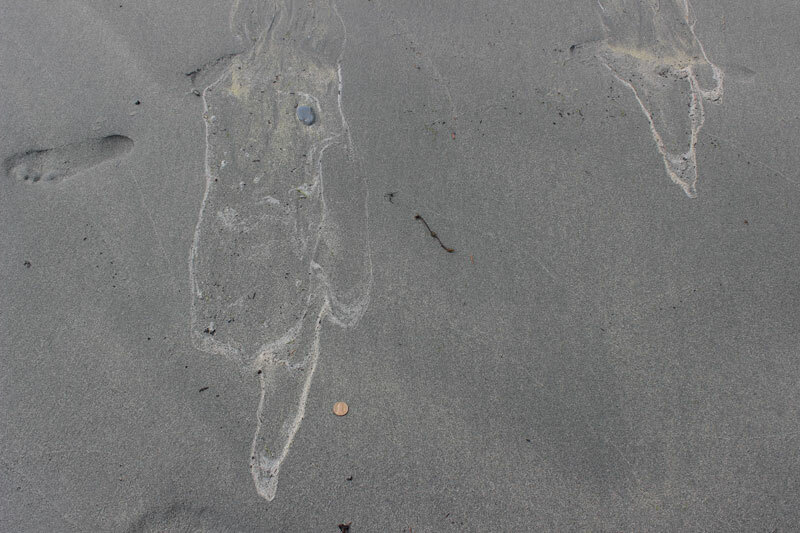 Concentrations of dark-colored heavy minerals were not common in most of the beaches we visited, however, Elliston Beach had an abundance of heavy minerals resulting in a greater visibility of some common beach structures (Figures 13 – 16). 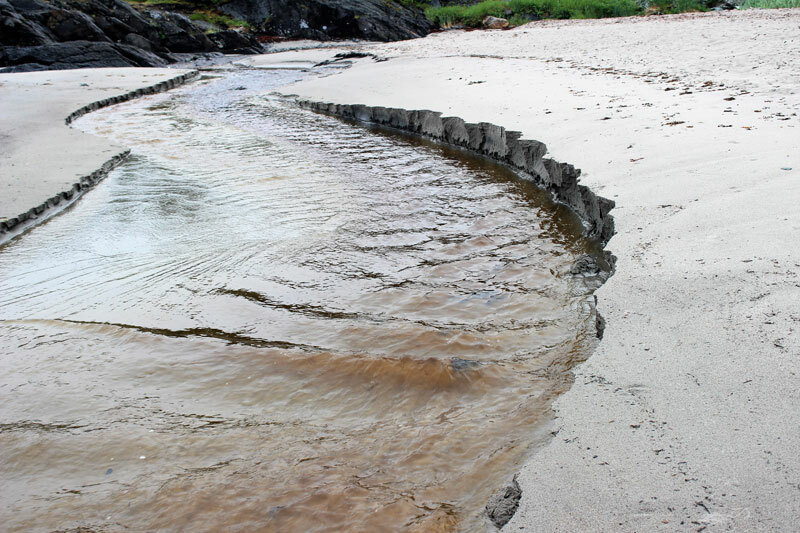 Like other Newfoundland beaches, Elliston’s is also water saturated as opposed to beaches that commonly have air-filled holes at low-tide which may explain why no air holes, blisters, or ring structures were seen. And Elliston is the root cellar capital of the world! 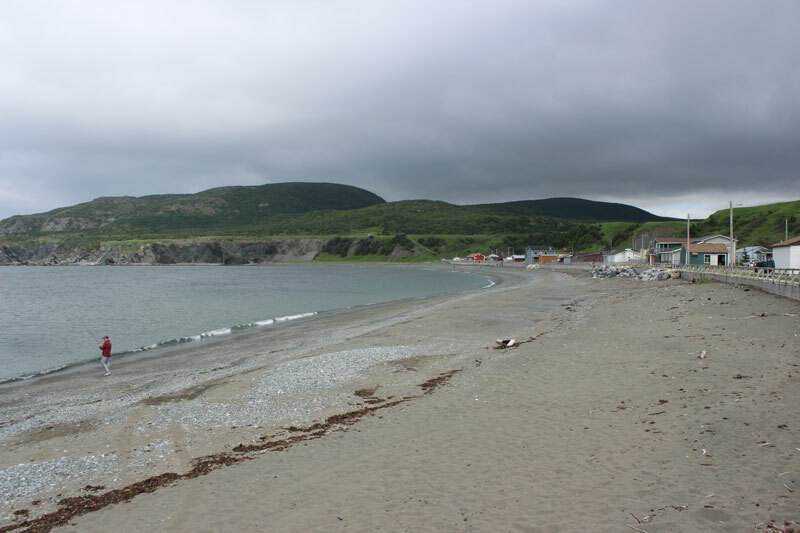 Like the rest of Newfoundland, gravel beaches are more common in the Avalon area than sand beaches, but Salmon Cove sands is one of the exceptions (Figure 17). 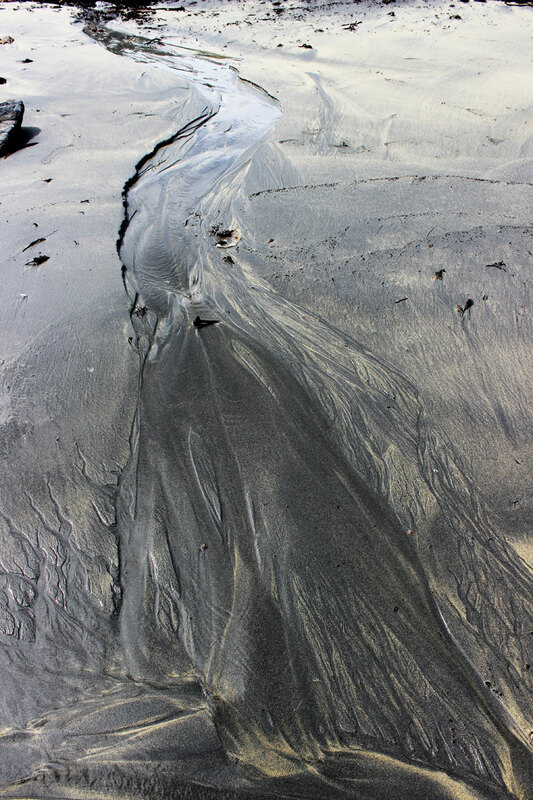 Once again we see that the beach owes its origin to the ready source of glacially-derived sediment, delivered by a river into the head of an embayment. 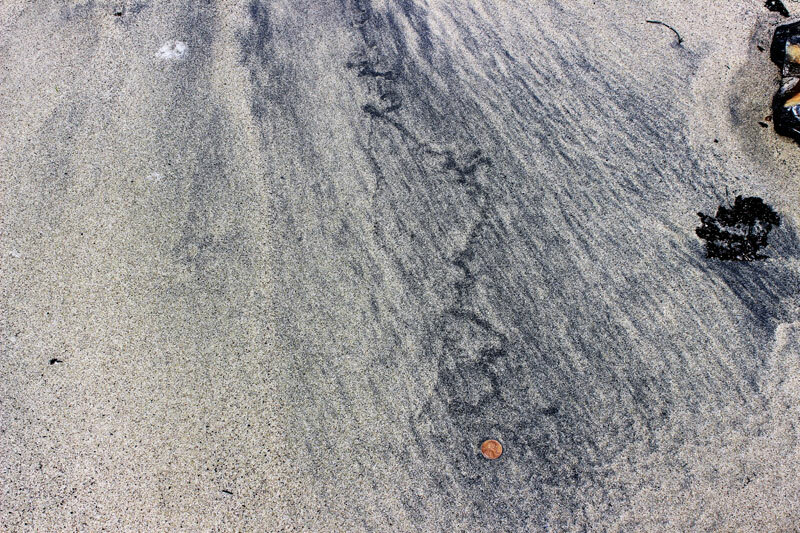 The beach is wide enough to have a dry back-beach area of sand that the wind works on to produce sand dunes, and, on a finer scale, adhesion structures when dry wind-blown sand sticks to the wet-sand surface of the beach (Figure 18). 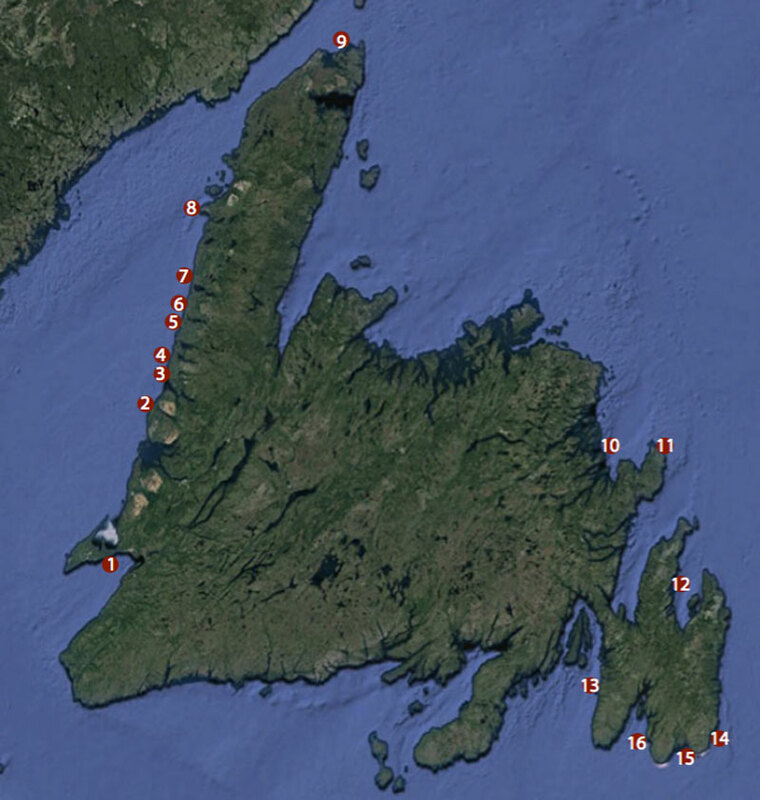 The Placentia area also has mixed gravel and sand beaches, as well as old beach ridges inland that mark former shorelines (Figure 19). To develop a beach-ridge plain requires a large source of sand and gravel that is released and accumulates episodically during storms. It is unfortunate that this area was developed by the government to re-settle people from remote villages and erosion is held at bay by a large seawall. If scenery is what you search, the coarser beaches of Avalon have plenty to offer. 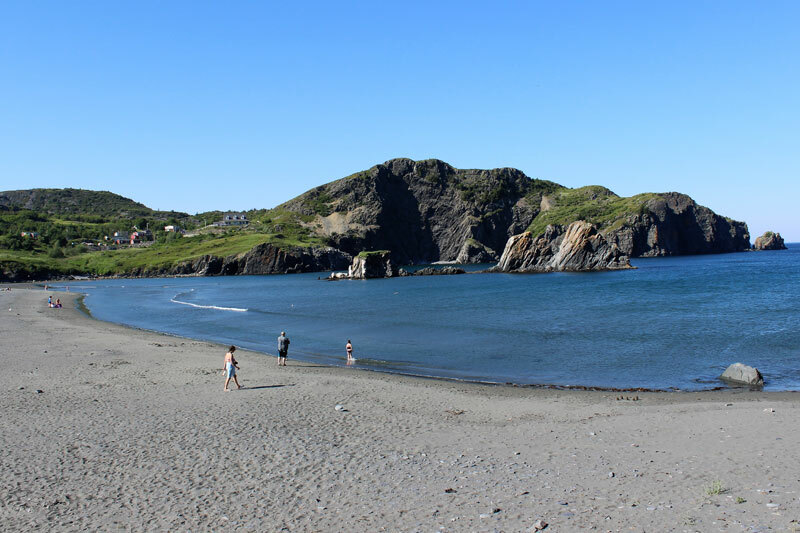 Chance Cove Provincial Park is a good example of a panoramic view area where there is not only a scenic beach (Figure 20), but also the opportunity for spotting whales, sea birds and ice bergs. 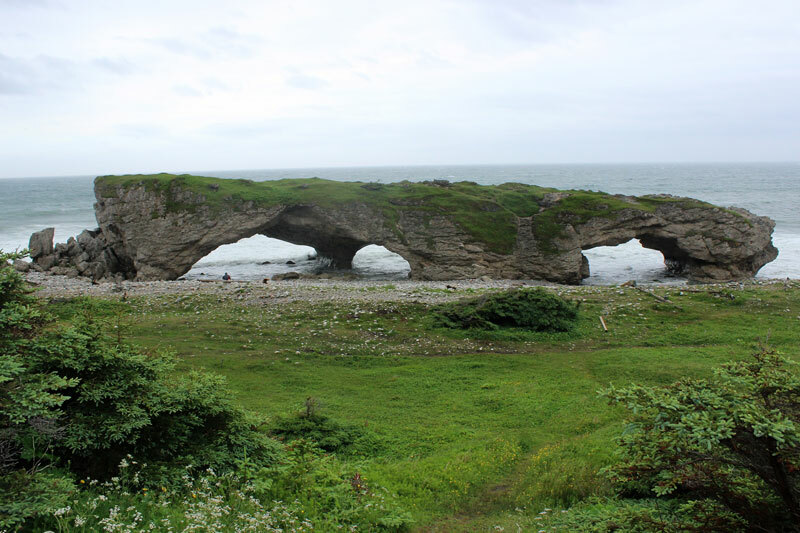 The coarse pebble beach at St. Vincent’s may not have the pebble variety you seek, but a walk in the gravel is well worth the experience of seeing a whale breach in the nearshore. 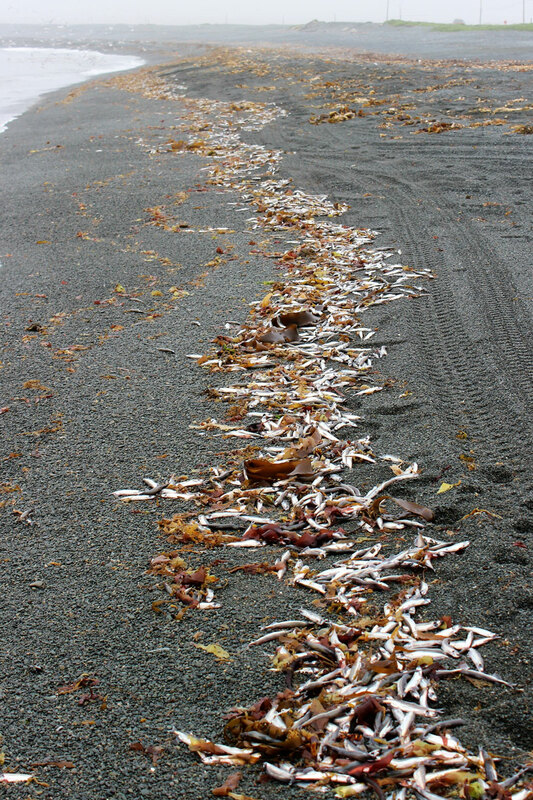 Whether sand or gravel, every beach is different, each with its own surprises, like finding a wrack line that looks like it could lead to a sardine factory (Figure 21)! Newfoundland’s beaches are no exception – even when the waters are too cold for swimming, these beaches are a combers’ delight.